It feels like every day scientists uncover a new way the Earth will undo itself -- meteors, earthquakes, and even major storms are enough to make you fill an underground bunker like you're living in The Road. And today one more event was added to the list of things that spell inevitable doom: Yellowstone National Park's supervolcano is more like a ticking timebomb than ever thought before. 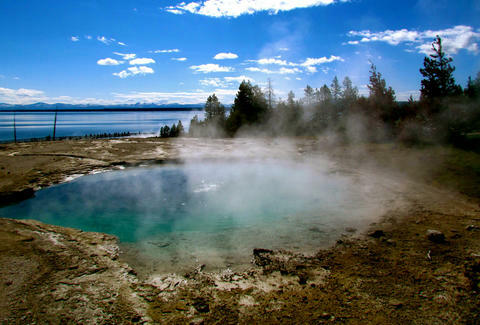 The 300 active geysers and underground magma chamber in Yellowstone have been known for a while, but seismologists from the University of Utah just discovered another magma reservoir underneath the long-known, shallower chamber. The original is said to contain enough magma to fill the Grand Canyon 2.5 times. That’s a lot of molten rock. But the newly discovered magma reservoir is more than four times that size, able to fill the Grand Canyon 11 times. OK, now THAT’S a helluva lot of molten rock. According to the University of Utah, the new reservoir was discovered using seismic imaging, which is something like a CT scan, but with earthquake waves instead of X-rays. Basically, they were able to detect magma because earthquake waves travel faster through regular rock than through molten rock. The Utah-based team also had access to more advanced seismometers that produced higher quality images. All this scientific information does not mean the supervolcano is any closer to erupting, however. The amount of magma has not increased; it's just the first time anyone's seen it. In fact, researchers say that there is a one in 700,000 chance that the volcano will erupt anytime soon. But all it really takes is one time for everything to go boom. Just ask the former residents of Pompeii. Which, you can't. Because they all died.